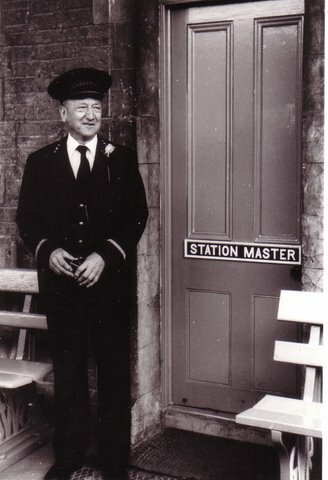 Norman Stone in his GWR Guard's uniform at Buckfastleigh. It is with much regret that we record the death of NORMAN STONE - a former Chairman and President of the SDRA. Norman, aged 89, passed away during the Easter weekend. He is survived by his wife Kay, and family. A Service of Appreciation of his life will be held at Torquay Crematorium on Tuesday, 13th April at 3.30pm - bright colours please. Unfortunately more precise details are not listed in the Notice printed in the Torbay Herald Express 8/4/10. Andrew Fiderkiewicz has been asked by Mrs Stone to say a few words by way of eulogy. Anyone with suitable memories can contact Andrew at work. No flowers by request. Donations to the RAF Benevolent Fund. There were about 15 SDR members present in the congregation of about 75 persons at Torquay Crematorium including the South Devon Railway Trust chairman.